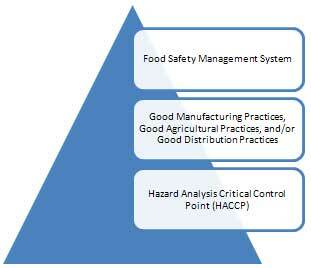 Third-party verification and certification to food safety standards is a wide and growing trend in the food industry. This means that for businesses to remain competitive they must increasingly adopt certified standards – and be subjected to food safety audits on a regular basis to maintain this certification. Whether audits are line-specific, product-specific or system wide, audits consume time and resources – so there is great impetus to reduce the total number of audits a business is subjected to by reducing redundancy among global standards and variations in customer requirements. The Consumer Goods Forum, an international body headed up by some of the world’s largest retailers, created the Global Food Safety Initiative (GFSI) to address the issue of differences in standards on a global scale and reduce resultant audit inefficiency. By ‘benchmarking’ specific food safety schemes against the GFSI guidance document, standards are identified that are very widely accepted for global trade requirements, providing a common ground for food businesses – both those that need to comply with standards, and those that require their suppliers to be certified against them. While GFSI-recognized standards are certainly not the only ones out there, becoming certified to a GFSI scheme increases a business’s desirability to trading partners, and saves money by reducing the burden of multiple customer audits and variations in requirements. As the mission statement of the GFSI affirms, the goal is “Once Certified, Accepted Everywhere”. Ideally, the fewer schemes the better – the more consolidated and all-encompassing the schemes become, the fewer differences will exist between individual customer requirements, and therefore fewer audits conducted. However, even as schemes become more alike, due to the nature of the food industry, there are still a few options to choose from. So, where do you begin? Key differences between the certification schemes involve where you are in the supply chain (primary producer, manufacturer, logistics/transport and so forth), your product sector (aquaculture, produce, meat, poultry etc.) and also the scope of your business (local versus international trade). In addition to determining what you are missing, choosing a food safety standard often means building on strengths you already have. Rather than trying to build from the ground up, conduct an analysis of your existing systems and see how these schemes can augment what you already have in place. Increasingly primary and secondary packagers are being asked to ensure the safety and quality of packaging materials for the food industry. Currently there are two global packaging standards. In recent years there has been a large increase in the number of individuals identified who suffer from food sensitivies identified as food allergens or individuals who suffer from Gluten Intolerance otherwise known as Celiac Disease. Manufacturers can ensure that their food products are safe for consumpution by ensuring their labels meet new legislative standards for food allergens that must be identified on food packaging labels or having their Gluten Free products audited by a third party to ensure they meet the minimum thresholds allowable.